Drive with caution. Roads are extremely slippery following rain. Avoid driving on the access road and the road through the park in wet conditions. There is a high probability of accidents, or of becoming stuck. Carry chains and a shovel, even in summer. The Junction Sheep Range Provincial Park consists of rolling grasslands and deeply eroded gullies at the confluence of the Chilcotin and Fraser Rivers in central BC. This unique landscape is a place of spectacular scenery, with cliffs and hoodoos breaking the grassland benches. The park was originally part of a Wildlife Management Area managed by BC Environment. It was then proposed for protection through a wide variety of planning processes including the Protected Areas Strategy and the Cariboo-Chilcotin CORE process, and was designated a provincial park in 1995 through the Cariboo-Chilcotin Land Use Plan. 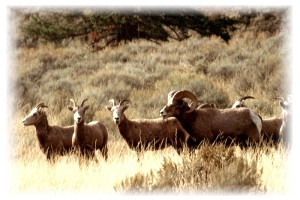 The area is protected most notably because of its importance to an internationally significant herd of California bighorn sheep. To learn more about conservation efforts to preserve the values in this park, click to view Cariboo Chilcotin Conservation Society’s webpage [non-government website]. Camping is not permitted in the Junction Sheep Range Provincial Park or on the private property of Riske Creek Ranching. Trampling of the cryptogamic crust, largely composed of lichens, causes soil erosion, and lichens may take many years to re-establish. Please stay on public trails and do not drive on or trample the lichen crust. Weed infestations, often introduced accidentally by vehicles, are a serious threat to habitat for wildlife and cattle. Please check your vehicle before entering the park and remove and destroy any plants caught in the vehicle undercarriage. The Junction Sheep Range Provincial Park is located at the junction of the Fraser and Chilcotin Rivers. The closest major center is Williams Lake. Access to the park is difficult, via rough 4 x 4 dirt roads through private ranchlands. For map information, please refer to topographical map numbers: 1:50 000-92O/16, 92O/15, and 92O/9. Approved Management Plan [PDF 1.19MB] for Junction Sheep Range Provincial Park is available online in pdf format. Horseback riders must remain on roads. Please use only weed-free pelleted feed for horses, since import of weeds is a major concern in the park. The park is open to hunting and horses can brought in for hunting. Please check the BC Hunting and Trapping Regulations for more information. If you must bring your dog to Junction Sheep Range, it must be under control at all times. It is illegal to allow your dog to harass wildlife or livestock. You are responsible for its behaviour.Backcountry areas are not suitable for dogs or other pets due to wildlife issues and the potential for problems with bears. There is no viewing platform but it is possible to see California bighorn sheep and mule deer throughout the park.